Today was town day and I really was down to my last bit of food. Breakfast was my last bar with peanut butter. Then I started up the hill. It wasn’t a terrible climb, but lots of faster hikers passed me by. A pair of trail runners ran by me. Next to a stream, I heard an odd little cluck. I noticed a big gray ground dwelling bird and her chicks running around in the bush. They didn’t seem particularly alarmed by my presence. “What are you?” I asked the birds. 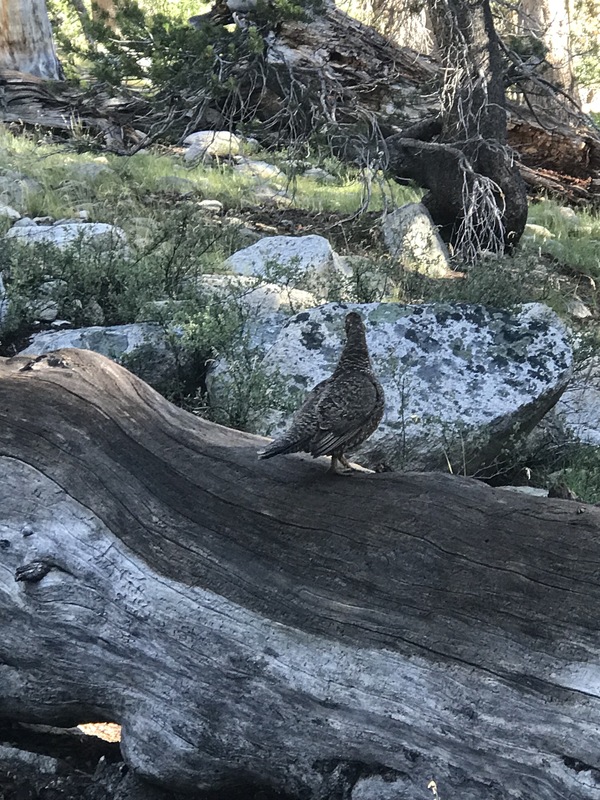 Mountain grouse? Forest chicken? Kearsarge Pass is a mere 11,000 feet. Above tree line but just not nearly as hard as the last couple days of climbing and wetness. At the tree line, I told myself I bet I can walk all the way to the top without taking a break. For once, I felt super strong. At the top, I talked to some people about getting a ride down to Independence. Just about everyone was headed that way. I would have no trouble catching a ride. “You’re a PCT hiker? Am I allowed to know your trail name?” One guy asked me. “Those are for the kids. My name’s Gretchen.” I told him. The walk down to the trail head was crowded. Sunday afternoon is prime hiking time. Baby hikers, elderly hikers, hiking dogs trickled up the trail. Then the rain started. And by the look of the sky, the hail would soon follow.